this solution doesn't work for most of the people with this problem!!! I got a different error after enabling Compatibility Mode, something to do with "Can't create iFS Filesystem" or something like that. 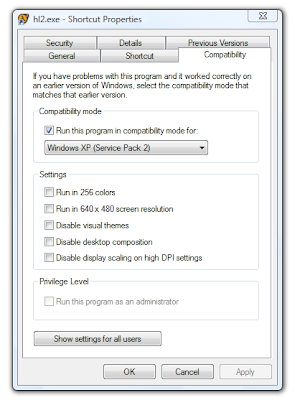 Then in the same Compatibility Dialog Box, I also checked "Run this program as an administrator" and Voila! Running fine now. At Anonymous, the reason is because you are launching from the Desktop, it needs to be launched from the Steam environment. thanks yaar ,it really work for me ,great. i have windows 8 ...it doesn.t work with any of the list .....why ??? thanks a lot!!! worked for me! Win7 64 with 4 GB all works! I can't run HL2 on XP 32-bit (128mb err). Compatibility with NT/95/98/2000 doesn't help. On other my PC with Windows 7 64-bit HL2 runs perfectly. How to run HL2 on my XP 32-bit?